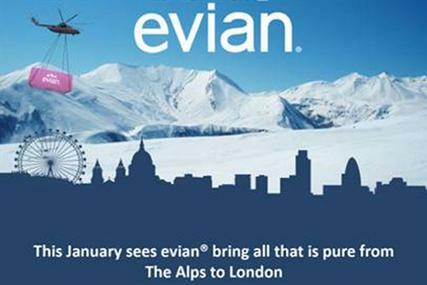 Evian has launched an original campaign to bring an Alpine experience to consumers in London. The interactive project is taking place on London’s South Bank. Consumers can apply for a 45-minute slot within a specially designed container planted on the South Bank, to receive a “one-off pure experience”, including fresh air from the Alps and a warm log fire. The campaign was created by agency Design Arrival and PR agency Shine Communications. To participate, consumers can apply through the Evian Facebook page till January 15. Then, they can go with up to six friends to experience the space. To enjoy the ‘Alps’ even more, Evian’s consumers can choose a range of ‘Alpine surprises’, ranging from a troop of Lederhosen dancers, to a fleet of puppies to play with in the container. People also can breathe fresh mountain top air and enjoy a log fire with views over The Alps, while in the container. The campaign and the consumer experiences within the container will be filmed for people to watch on YouTube. Blandine Stefani, marketing director at Evian said in an interview to Marketing magazine that“January was an opportune time to create a purity experience for consumers and to reiterate the benefits of drinking water, explaining that “people don’t drink as much water at this time of year”. Depending on its success, the campaign could be reproduced in other cities. Evian will also continue the marketing activity with its famous ‘Evian Babies’ campaign as well as ‘Live young’ campaign.